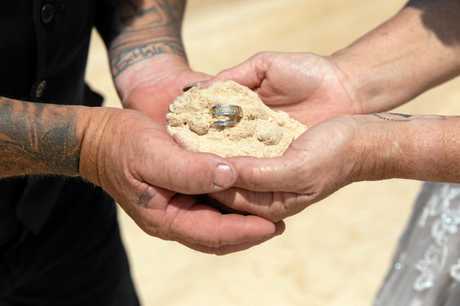 IT WAS the perfect catch for one couple who met online three years ago. 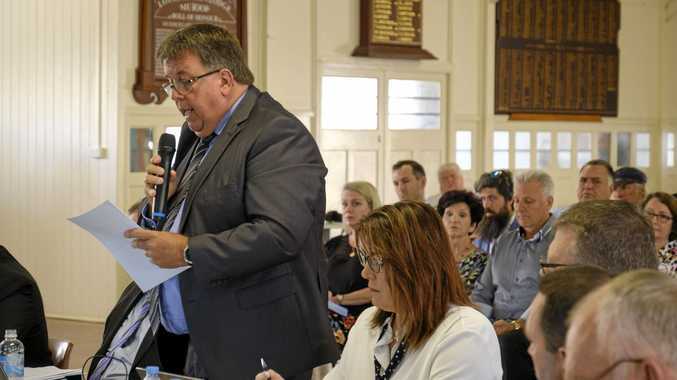 Bricklayer Craig Partridge and his wife Sonya, a store manager in Brisbane, met on the website Plenty of Fish and she says the rest was history. 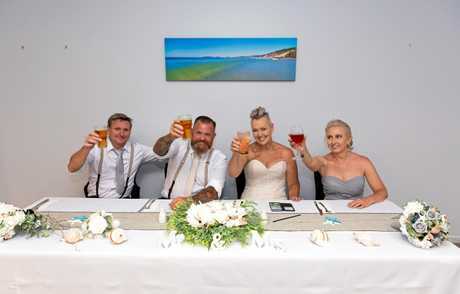 The pair decided to have their wedding at Rainbow Beach surrounded by their loved ones from Brisbane, Mackay, Melbourne and New Zealand. Sixty guests attended the wedding. Mrs Partridge said Rainbow Beach holds great significance to them both. 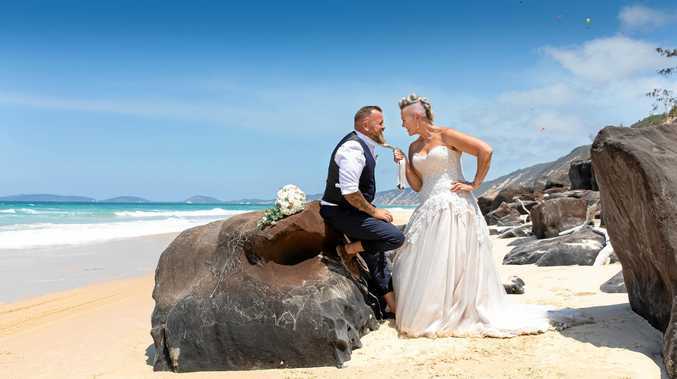 "Since Craig took me up to Rainbow Beach on my first camping trip about three years ago it's always been hard to stay away and we frequent Rainbow beach often and regard it as our second home, hence why we chose to get married in our favourite place to be," Mrs Partridge said. Sonya's maid of honour was Tracey Hall and Craig's best man was Gavin Hall. Craig and Gavin wore navy two pieces, Tracey wore a light grey corset back dress. Sonya wore an elegant, champagne coloured wedding dress. Hair was done by Rainbow Hair and Beauty studio. Tracey and Sonya made the bouquets. Zaneta Fitzgerald officiated at the ceremony at Mudlo Rocks, followed by the reception at Brent's Burgers, formerly known as Coffee Rocks. Sonya thanked everyone for a great day. 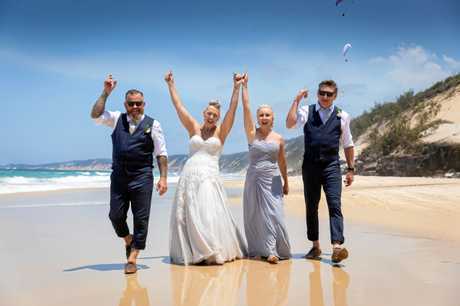 "Jess from Rainbow Beach wedding photography was amazing and fun to work with, capturing our day beautifully," she said. 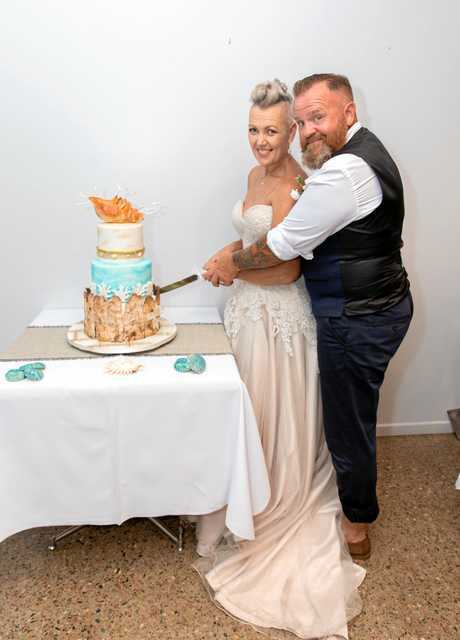 "Tin Can Bay Rainbow Beach weddings and party hire supplied the seating for the ceremony and our amazing wedding cake was made by Jennie Tritton. So with the wonderful help of local businesses in Rainbow Beach and Tin Can Bay, working so well together our wedding day was amazing. It's a beautiful place."